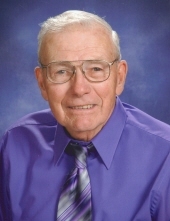 Raymond Arthur Kukanich, age 85, of Rhinelander, died on February 8, 2019 at the St. Mary’s Hospital in Rhinelander. Ray was born on August 29, 1933 in Eagle River, Wisconsin to Joseph and Julia (Kauzlaric) Kukanich. He was raised in Eagle River and attended schools there. Ray was drafted into the US Army and served his country during WW II. Ray was mechanically inclined as a child. He greatly improved those skills while serving in the Army and it provided a lifelong skill that supported him and his family. He was employed as a mechanic in Milwaukee and Stevens Point and actually worked on “The Ducks” in the Dells. He retired from UPS in Rhinelander where he served as their mechanic. Ray married the former Mary Pabst on September 23, 1961 in Milwaukee. They lived in Milwaukee briefly and then moved to Rhinelander in 1965. Other than a couple of years in Stevens Point, Rhinelander was their home. Ray would tell you that he married Mary to get his hands on the Pabst fortunes but it did not work out as he planned. That was one of the best parts of Ray, he loved no one more than his “Mary” and his daughters, but he had a wonderful sense of humor. If you ran into Ray you were going to leave with a smile on your face and a new story. Beyond the laughs and the stories was a kind and caring man who so missed his wife. Mary preceded him in death on February 13, 2012. Ray and Mary were longtime members of the Nativity of Our Lord Catholic Church and Ray served as an usher all of those years. In his spare time he loved tinkering on old tractors and the like. He looked forward to his weekly coffee with his good friends. Ray is survived by his daughters Debra (John “Jack”) Schaefer and Lisa (Thomas) Norling, his grandchildren Patrick and Emily Schaefer, his sister Julianna (Don) Densow, his brothers Joseph (Alice) Kukanich, Julius (Betty) Kukanich and Quentin (Patty) Kukanich, his sister in law Edith Kukanich, nieces, nephews, other family and many friends. In addition to his wife, Ray was also preceded in death by his parents and his brother Leon. Visitation for Ray will be held on Saturday, February 16, 2019 from 3:00 pm to 5:00 pm at the Carlson Funeral Home and from 12:30 pm to 1:30 pm on Sunday, February 17, 2019 at the Nativity of Our Lord Catholic Church. A Mass of Christian Burial will be held on Sunday, February 17, 2019 at 1:30 pm at the Nativity of Our Lord Catholic Church with Father Michael Tupa officiating. A full notice will follow in Tuesday’s River News, at www.carlsonfh.com and in the Vilas County News Review. You may leave your private condolences for the Ray’s family at www.carlsonfh.com. The Carlson Funeral Home (715-369-1414) is serving the Kukanich family. There will also be visitation from 12:30 until just prior to the services on Sunday, February 17, 2019 at the church. "Email Address" would like to share the life celebration of Raymond Arthur Kukanich. Click on the "link" to go to share a favorite memory or leave a condolence message for the family.